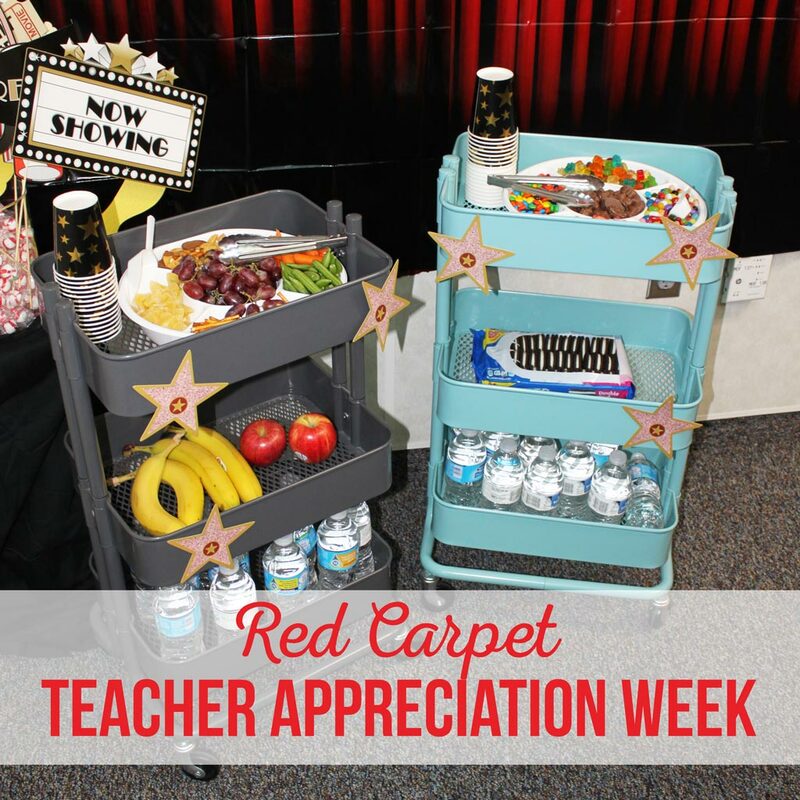 Food Ideas for Red Carpet Teacher Appreciation. 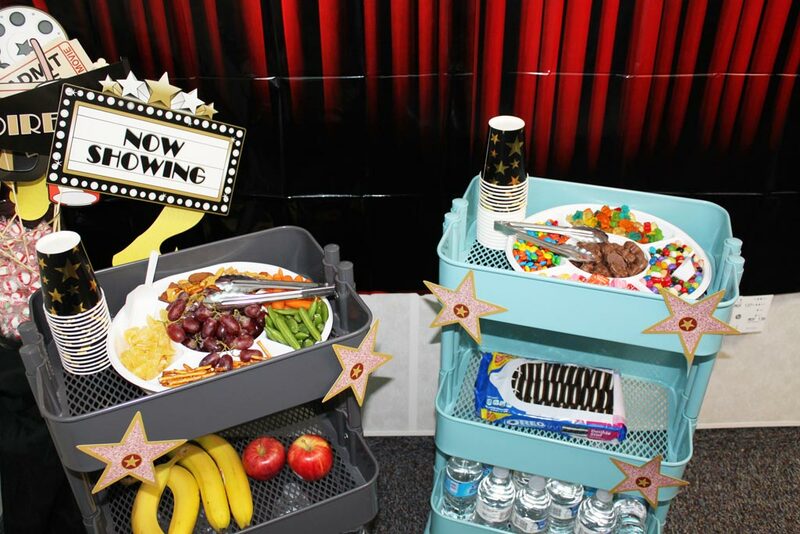 Treat your teachers like the stars that they are with these fun food ideas. This post is a done as a partnership with Oriental Trading Company. All opinions are my own. 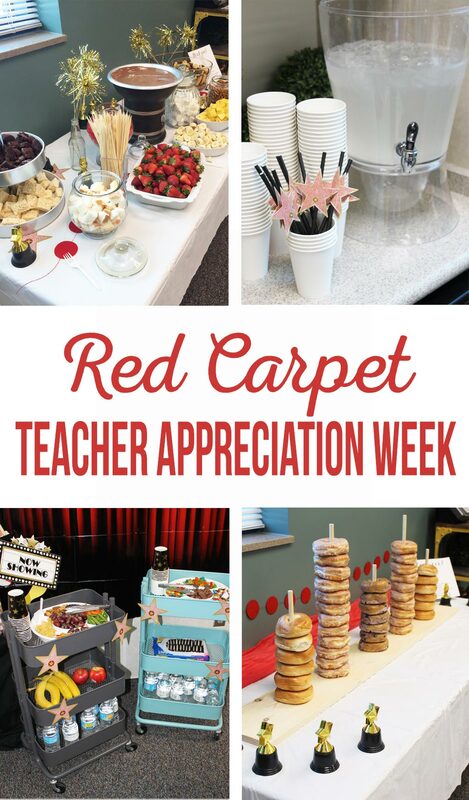 If you missed our first post with all of the decoration details for our Red Carpet Teacher Appreciation Week… jump over to THIS post. We figured that the way to most people’s hearts is through their stomach… so we tried to provide as many of their favorite treats during the week as we could. 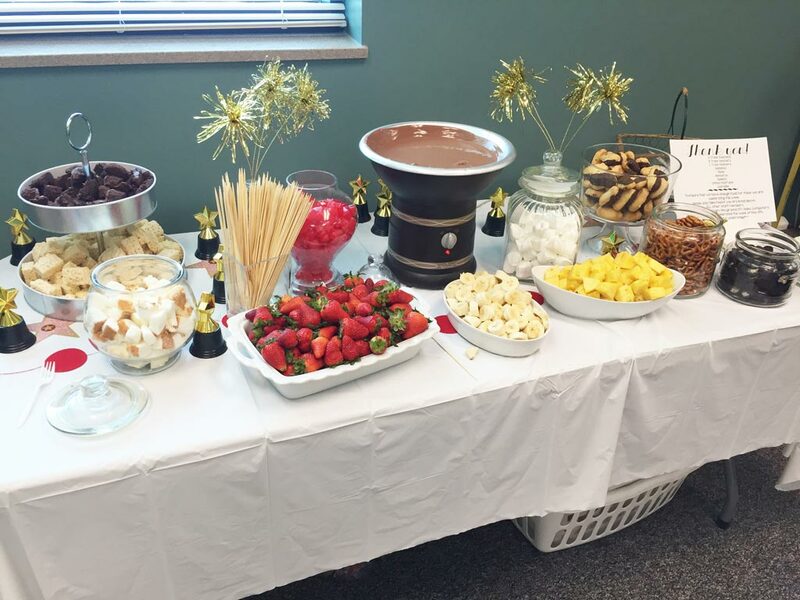 One day we had a Chocolate Fountain set up in the Lounge. It was beautiful! So many yummy things to dip in chocolate. Teachers were raving about this set up for days. 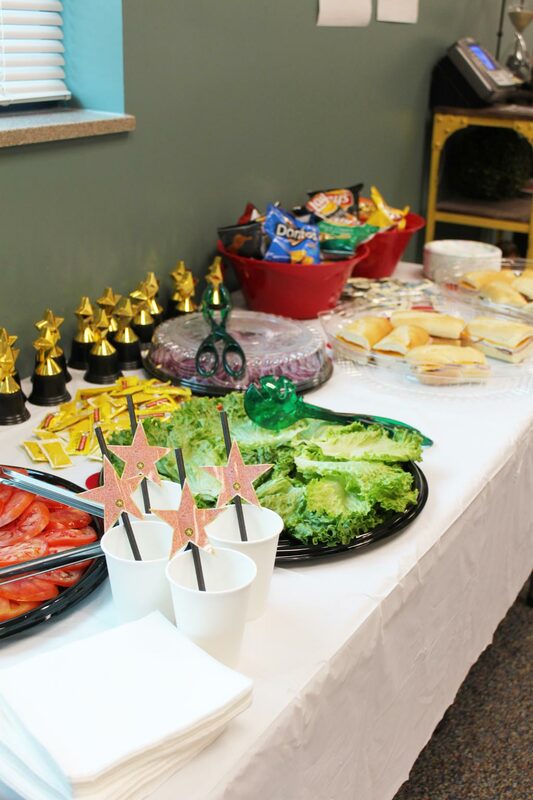 We kept the decor pretty simple… adding Star Trophies for accents. We brought drink menus around to the teachers one morning and delivered their drinks to their classroom, along with a homemade cookie, that afternoon. An afternoon pick me up is always appreciated! We added a sprinkle of Gold Star Confetti to the cookie bags to add a little sparkle. One day we provided a sandwich lunch for the teachers. Again, we kept the decor really simple by rearranging the Star Trophies on the table. 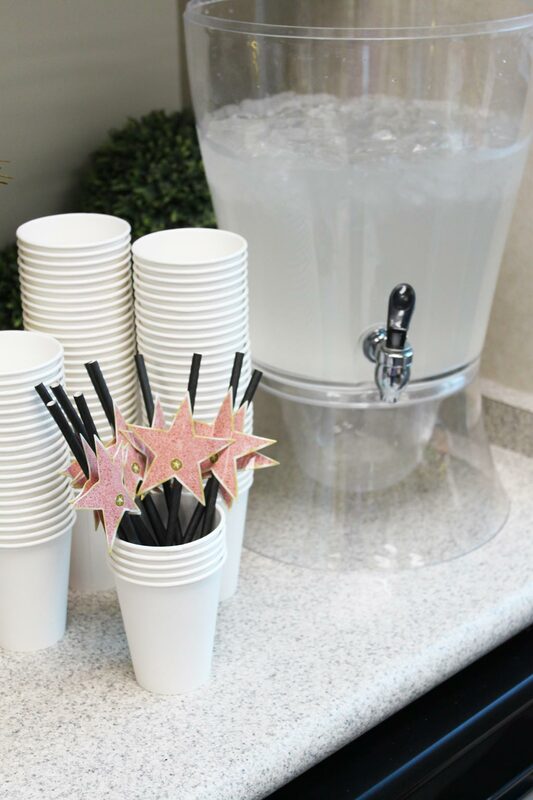 We also added Movie Night Paper Straws… a simple way to add decor. One morning we provided bagels and donuts for the teachers. The Star Trophies were just rearranged to fit around our display. 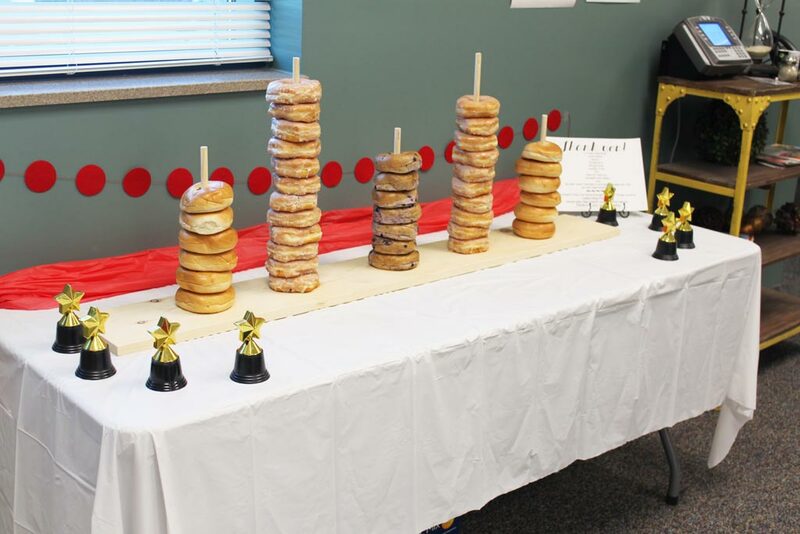 The donut display was made from a design by How Does She. It’s a fun display and we’ve used it for several parties! This one is my favorite. 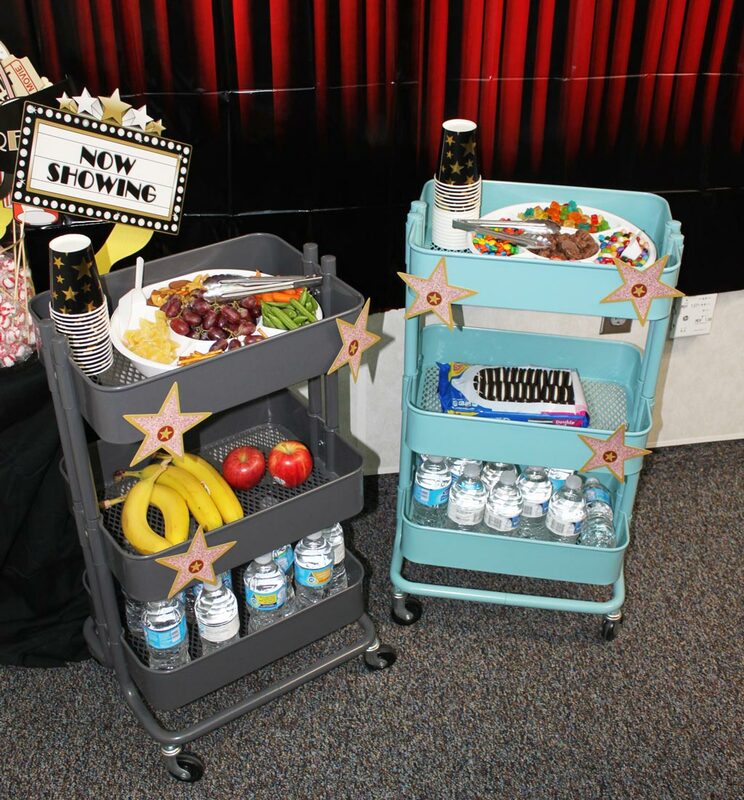 We brought these carts around to each classroom in the afternoon. 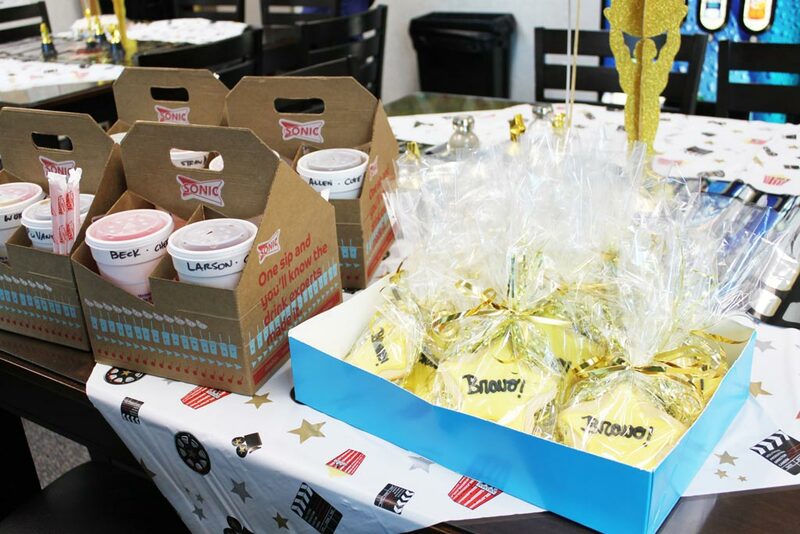 You know, just when the students are getting crazy and the teachers are getting sleepy… that’s when we show up with goodies! We’ve done this for several years and we’ve learned what the teachers like. We try to provide a good variety with lots of healthy options as well. We gave each teacher a Gold Foil Star Paper Cup to fill up with whatever they desired. No judgements. Ha! Fill it up with chocolate cinnamon bears or grapes or both! Whatever they want. Part of the fun is watching the students drool over what their teacher’s pick. We always tell the students that when they grow up and become teachers… they’ll get spoiled too. It’s amazing how many students want to be teachers by the time we are done! 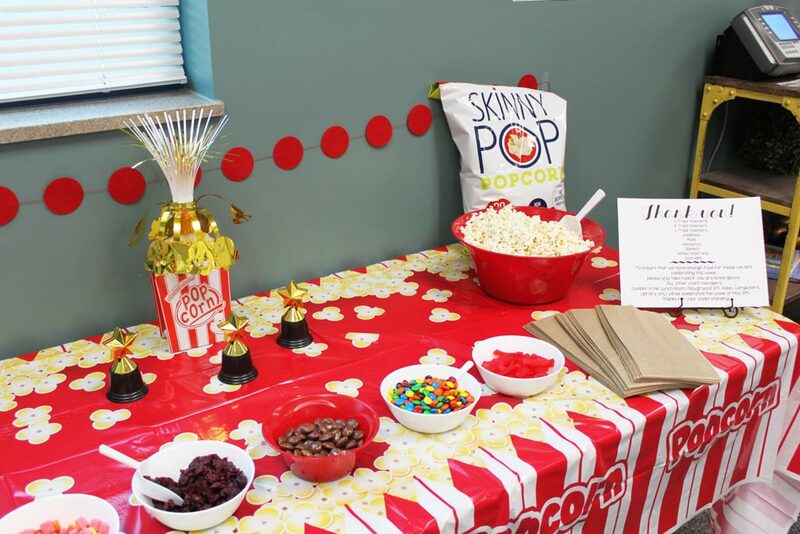 One day we had a popcorn bar set up for the teachers and an old fashioned movie playing as well. 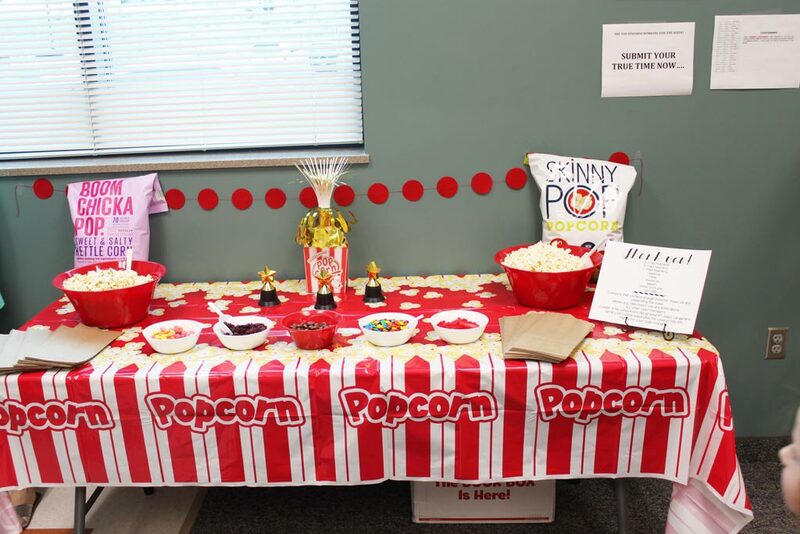 We used the Popcorn Plastic Tablecloth as our main decor on this day. Add a few trophies and you’re all set! We realize that we completely spoiled our teachers. But we had so many parents willing to help and it was so much fun… we just couldn’t cut anything out! We’d do anything to lift the spirits of our teachers and to make them smile!